Making an itinerary for a solo trip is already a daunting task, what more if you create a trip itinerary for an entire family? There are a lot of things you need to consider juggling, to the point that even the act of thinking to make all things work becomes a feat. However, having a family trip itinerary makes every family trip organized and memorable. Are you given the task of planning the itinerary for your family trip? Worry not for here are some guidelines that will help you in making an itinerary that will help you experience the best family trip yet. Breaking up your itinerary by morning, afternoon, and evening enables you to create an effective itinerary where you avoid exerting fruitless efforts in trying to visit all of the places and do all the possible activities within a limited time and just fit in what you can just manage realistically. 2. Visit well-known and busy tourist attractions on weekdays. If you want to have the whole site to your family or avoid long queues of people, schedule your travel plans on weekdays and morning if possible. Most people only have their free time during the weekends, making famous tourists attractions jam-packed on the weekends. Just schedule places that are less likely to be busy for the weekend. 3. Scheduled tours? Do it on your first day. If you have incorporated your DIY itinerary with a tour organized by a travel agency, make sure you schedule it on the first day of your family trip. Through this, you will get more acquainted of the place and plan out more activities without having getting lost and with the possibility of discovering new sites and activities. 4. Set your meals and downtime beforehand. Aside from scheduling the places you want to visit, do not forget to set a schedule for your snacks or meals and downtime as well. 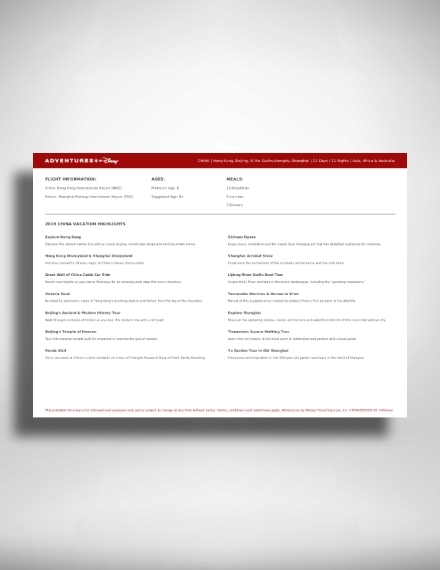 Make restaurant reservations so you would not have to worry about where to eat. Set your downtime at a chill tourist place or you can just go back to your hotel and take a nap. 5. Leave your last day open. This may be an ironic step since itineraries are used to schedule your activities for your family trip; however, having a free day will give you the opportunity to discover new places that are not yet found in travel blogs. You might also try to go back to a place where your family really enjoyed and loved. 6. Factor in travel time. No matter how good you were at plotting and scheduling activities for your family trip itinerary, it will still get ruined especially if you haven’t factored the travel time of going from one place to another. Consider the use of Google Maps to help you know the estimated travel time for taking public transportation or for walking. 7. Play around with your itinerary. You have to admit that balancing every single thing for your family trip itinerary is not an easy thing to do, that is why you should consider trying to move things around and take some things out so you can enjoy, at the same time, the process of making an itinerary for your much-awaited family trip. 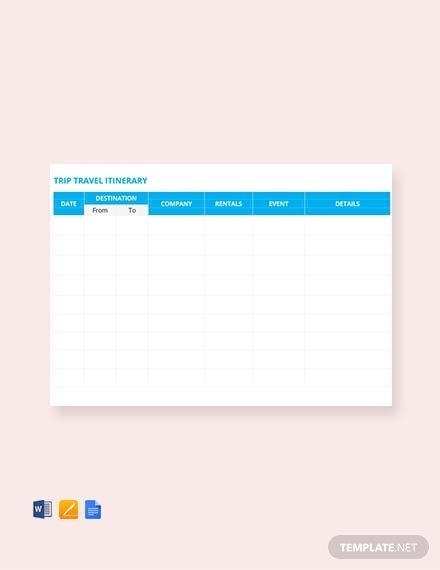 For your upcoming family trips, this family trip itinerary planner can help you carefully plan the places you want to visit, the restaurant where you can eat a certain dish or delicacy, and the overall activities you want to accomplish during the trip. 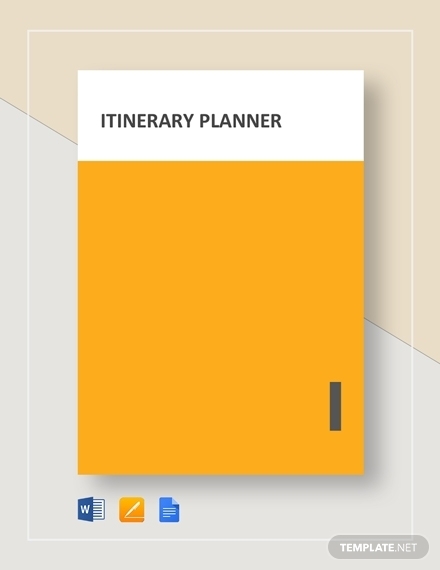 Whether it is a domestic flight or an international flight, this itinerary planner will make it possible for you to just enjoy the trip. Got your vacation request or your leave request approved for an actual vacation with your family? Make the best out of your leave with the use of this family vacation itinerary. This itinerary helps you in making most of out of the rare times your leave request gets approved by your employer and, of course, in making most out of your bonding time with your family. Spontaneous family road trips don’t have to be that spontaneous at all with the use of these family road trip itinerary. 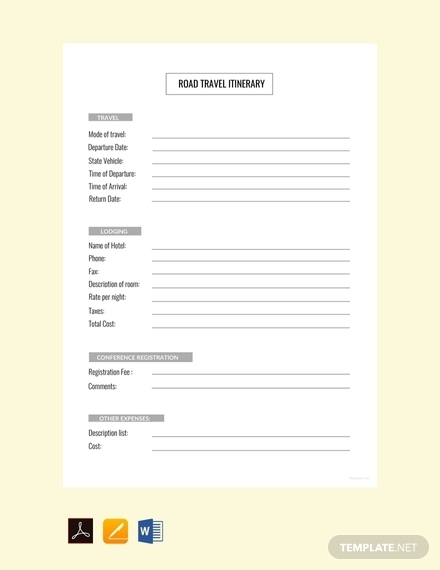 This itinerary will help you in having a well-defined trip agenda even within the limited time you need to work around during road trips and will help you avoid making any pointless stops. 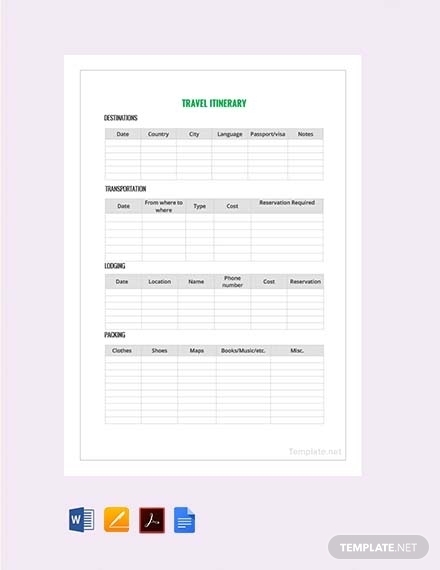 If you are looking for a basic itinerary that makes your family trip plans organized in an equally basic and simple way, consider the use of this sample family travel itinerary. This itinerary makes it possible for you to arrange your travel affairs in a simple but systematic manner. 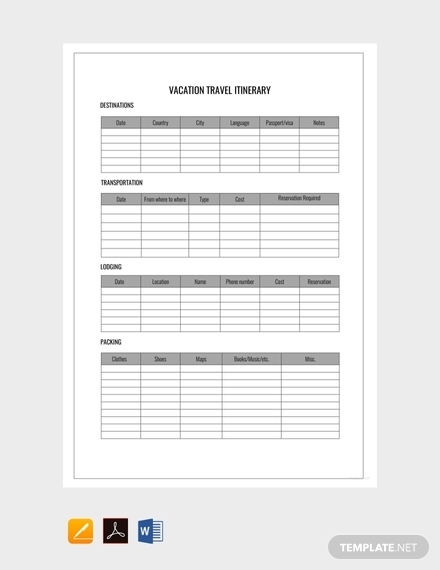 Organize your upcoming family trip using this family trip itinerary that you can easily download, edit, and print. 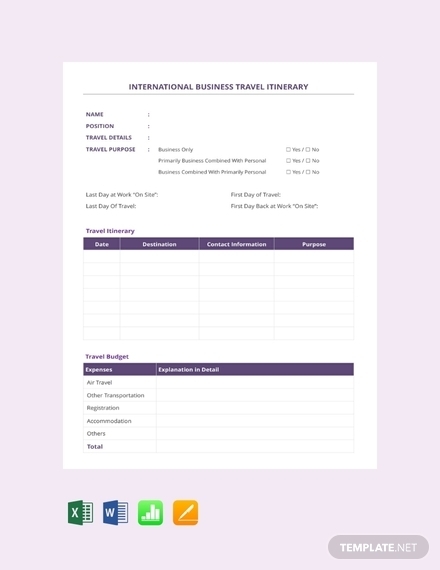 This itinerary contains a simple layout and design that will surely match your preferences, and if it doesn’t fully suit to your liking, you can easily just edit its layout around. 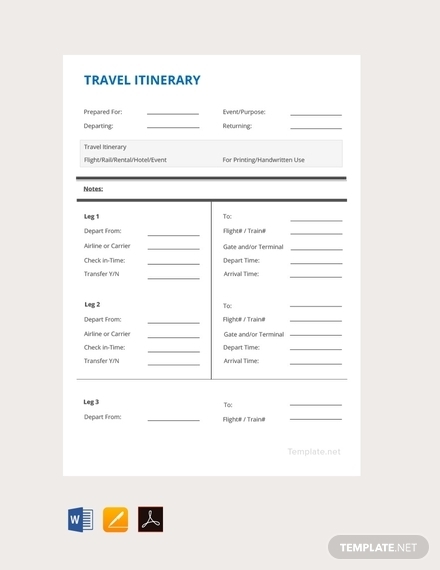 Avoid the stress that comes from last-minute travel planning and preparation for your family trip with the use of this simple family travel itinerary. And by simple, it means this itinerary immediately goes down to the essential travel affairs such as the lodging, transportation, destinations, and even the things you need to bring and clothes to wear. If you have a family business and that you are planning to have a family business trip soon, make sure you use this family business travel itinerary that will ensure you will have a worry-free family trip. This itinerary will not only make sure you will be able to attend to your business affairs but it will also give you the chance of having some leisure time. Going on a cruise ship for your family trip? Make it even more fun and organized with the use of this Cruise and Stay family trip itinerary. 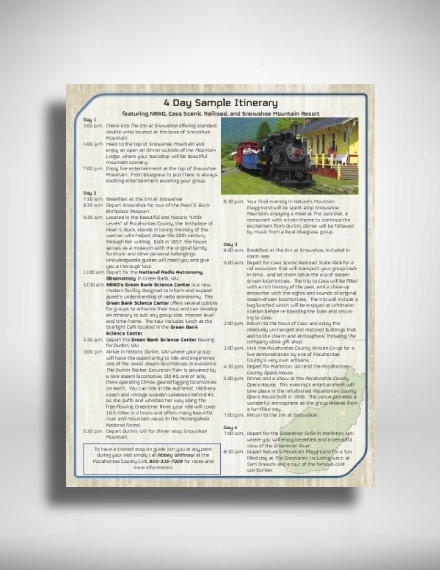 This sample itinerary is made by Disney Holidays by Walt Disney’s travel company. This gives you specific cruise ship activities that you can spend with your entire family. Are you going on a family trip to China soon? Adventures by Disney provides you with a guided China family trip itinerary that will surely make the most out of your China family trip. This itinerary readily schedules your activities, books your hotel and transportation, and reserves restaurants for where you will take your meals. Planning to go with your family to NRAO or the National Radio Astronomy Observatory? Then this itinerary made by NRAO will be of great help. This itinerary contains a guided tour for your family trip around the observatory where you will surely learn new discoveries and broaden your understanding of the universe. Keep in mind that there is no easy or perfect way of putting together an itinerary, especially for a family trip. But to let you have a smooth start in making one, consider the use of the best examples of family trip itineraries that are available in this article and you can never go wrong.